Picture books are notorious for depicting shapes and vocabulary suitable for young children, but Thong and Lin's book goes beyond the suggested three to five age limit and presents a beautiful, multicultural experience in learning shapes and vocabulary. 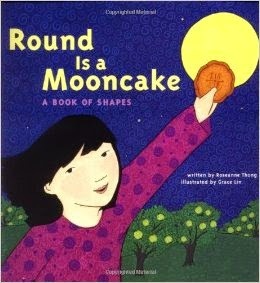 Many young children, and their parents, may ask, "what is a mooncake" to which the book cleverly answers in a short glossary as a "round cake with sweet fillings." Thong takes readers through three shapes: round/circle, square, and rectangle, which are probably the three basic shapes when a young child is first learning. Not only does Thong explain and Lin illustrate examples of each shape, but they also ask the reader to participate by answering "what other things do you see." Young children have the opportunity to show their parents other examples of each shape within the text, and the books lends itself well to allowing parents to show their children examples beyond the text itself. Lin's illustrations pair well with Thong's rhymes, providing endearing characterizations of the little girl, her cuddly pets, and her family. Lin's reds, oranges, greens, and purples pop on the pages and enhance the text. Ages three to five will love the book's delightful glimpse into the little girl's life, and readers of all ages will appreciate the global perspective.